Tel Mothrivra was once a great Tribunal Temple fortress built around a monastery dedicated to St. Delyn. 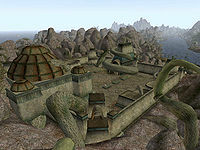 However, the settlement lost its military significance when Morrowind was made part of the Empire, and the fortress suffered from a significant loss of staff. At this point, the weakness was exploited by the Akaviri, who captured the fortress during their invasion. Abandoned, the compound fell into disrepair and decay, with monks its only occupants for many years. Eventually, its religious significance waned as well, and the Tribunal Temple was forced to sell the largely empty monastery to Dralothas Omothran. The new ruler of Tel Mothrivra has since set about making the old Velothi settlement more suitable for a Telvanni lord, and his actions as well as the impious nature of House Telvanni have done little to endear the new tenants to the Temple faithful still in residence. 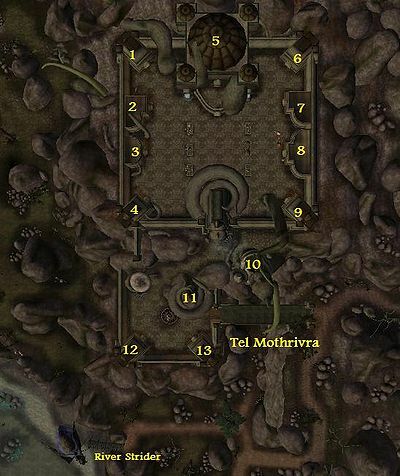 A cursory tour of the settlement would make the hearts of even the most ignorant citizens of Morrowind weep at the sight of monk cells being transformed into prisons and slave houses, and the ubiquitous Velothi ritual ash pits used as hasty storage holes with crates and urns haphazardly discarded among sanctified bones and whispering ash. The settlement itself is split into two sections. The lower part is a small courtyard with a statue to Saint Delyn the Wise. Presumably this was designed for visiting travelers and secular services, which could thus be kept separate from the ecclesiastical establishment. 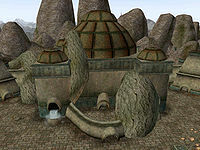 Now, among homes you will find the magic shop inside the Telvanni pod, and just before the wall to upper Tel Mothrivra is the obligatory Telvanni Tower - be sure to take a peek inside the "Turret" here. The upper part is a larger square with the decommissioned monastery building at its center. Not much here besides residences, guard quarters and the local tavern, The Glass Goblet, which provides room and board, as well. Do visit the monastery-turned-tower to peruse the various profanity inflicted upon the Temple's sacred sites, and chat with Llothis Dralor, one of the previous owners of the settlement, in his home on the west side of town. Take the Riverstrider southwest of town to Alt Bosara. The road north leads to Llothanis and south to Alt Bosara. An Egg Mine below the town supports the economy of the settlement. Various caves can be explored in the Boethiah's Spine around the fortress, and an Imperial farmer keeps his stock nearby. This page was last modified on 6 March 2019, at 08:56.